Dr. Fischer (Harvard Gradutate School of Education. emeritus) was the Charles Bigelow Professor of Education at Harvard Graduate School of Education, where he was the director of the Mind, Brain, and Education program. He greatly influenced our work at Lectica. Dr. Fischer's dynamic skill theory is a comprehensive theory of human development that not only describes mechanisms of development and a developmentsl sequence, but also considers the impact of contextual and interpersonal factors on learning (Fischer, 1980; Fischer & Bidell, 2006). At the heart of the theory is the skill, which is the capacity to act in a certain way in a certain context. Skills include emotions, motivation, meaning, and action (Mascolo & Fischer, 2010, p. 5). Skills develop through levels of increasing complexity, differentiation, and integration, within a dynamic system that includes self, other, and environment. There are many ways in which skill theory has impacted our work. Here, we describe our "top 5"—learning and development involve the whole brain, cognition develops through levels and tiers, context matters, learning is slow and variable, and support is essential. Mental development involves the entire brain and is impossible without social interaction. Even a concept like the physics of energy is best learned in an environment that engages learners emotionally, motivationally, kinesthetically, and reflectively. In 1980, Dr. Fischer introduced the dynamic skill scale. It is portrayed in the figure on the right. According to Dr. Fischer, development involves 3 major restructurings of thought, each of which ushers in a new kind of concept. The first restructuring occurs when the sensorimotor skills of infancy are transformed to emerge as the concrete concepts of early childhood, which Fischer calls representations (R in the figure). In pre-adolescence, systems of representational systems become the new concepts of the abstract tier (A in the figure). 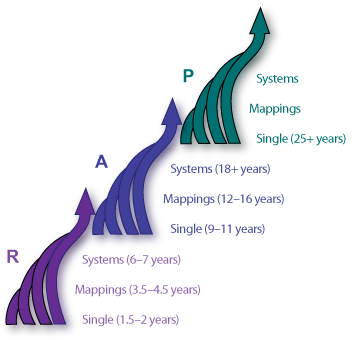 And finally, in adulthood, in a small percentage of the population, systems of abstract systems become the concepts of the principled tier (P in the figure). The new concepts of each tier are used in increasingly complex ways as people move through the tier. So, for example, in the abstract tier, there are single abstractions, abstract mappings, and abstract systems. 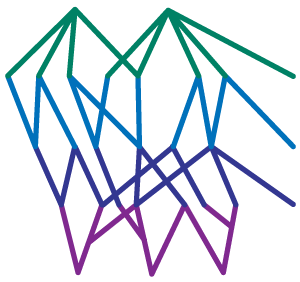 Single concepts, mappings, and systems characterize every tier. As people develop along this scale, their thinking become increasingly abstract, complex, and integrated. At DiscoTest, we use Dr. Fischer's skill scale as the theoretical underpinning for our Lectical® Levels. We chose his model, because we were able translate its clear structures into scoring rules that produce accurate and reliable developmental scores. We call this set of scoring rules the Lectical® Assessment System (LAS). It's the cornerstone of our assessment system. Without the LAS—our learning ruler—Lectical Assessments would have been unimaginable. Skills develop over time by growing increasingly complex. But, importantly, they do not develop in a vacuum. Dr. Fischer's research has demonstrated that skills develop in contexts. Contexts include (1) the external world—the environment or setting where the skill is being carried out; (2) the internal world—including a range of emotional and biological states; and (3) the interpersonal world—other people and the levels of support, challenge, or stress that they provide. Because skills are constructed in specific contexts, they don't typically transfer well from one context to another. For example, the fact that a student understands the mechanics of calculating a ratio well enough to do well on a typical math test, does not imply that she will be able to apply the skill in real life. In fact, it does not even imply that she will recognize a situation in which it should be applied. This is why students need to learn and practice skills in contexts that are similar to the ones they will encounter in life, and it's one of the reasons why DiscoTests require students to address "real world" problems. Skills are constructed over time, and as Dr. Fischer's research has shown, variability in skill performance is normal. Development is not like climbing a ladder, where each step up equates to the perfect achievement of a new set of skills. Instead, development is like a spider's web, with growth in change through many pathways at once. Different skills can be at different levels of complexity at the same time. There can be differences across domains, where (for example) math skills might run ahead of social studies skills. Or there can be differences within domains, where multiplication skills might run ahead of division skills. There is also variability within a single skill. Students may demonstrate a skill in one context, and fail to do so in another. A period of building skill followed by regression is also normal. When students are building a new skill or concept, they are likely to "forget" what they've learned a few times before the new skill can be taken for granted. Because all DiscoTests are calibrated to the skill scale (a.k.a. the lectical® scale), DiscoTest report cards reveal much of the variability Fischer and his colleagues uncovered. For example, in the DiscoTest Report Card shown below (Each circle represents a testing event, the x axis represents school years, and the y axis represents the skill scale. ), it's easy to see that Marilyn developed her social studies skills more slowly than she developed her physical science skills. 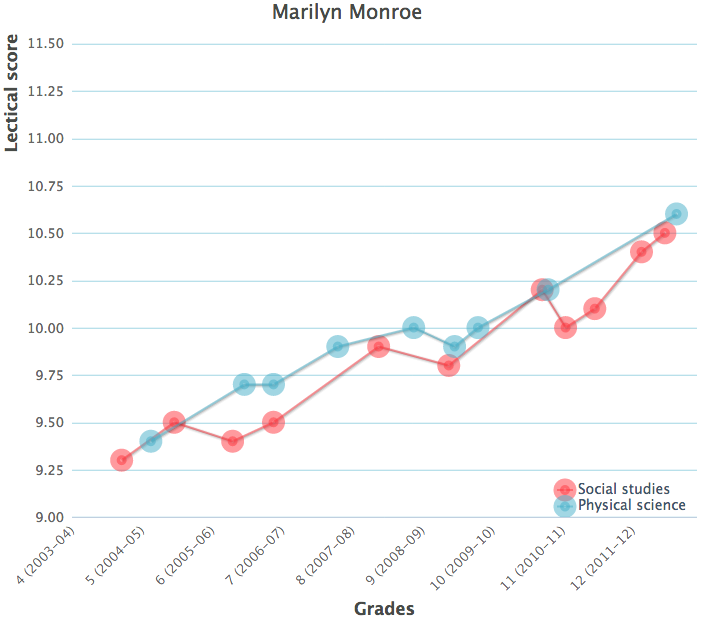 Her social studies learning trajectory is also more uneven than her physical science learning trajectory, with a couple of unusual drops in grades 8 and 10. Interestingly, Marilyn did not find social studies very interesting until high school. She also disliked her 8th grade social studies teacher and was ill when she took her first 10th grade social studies DiscoTest. Finally, we suspect that Marilyn's rate of growth in both subjects increased dramatically in grade 11, when she found out that her parents could afford to pay for college. Dr. Fischer and his colleagues have repeatedly shown that learning takes time, practice, and support. Learners can generally construct a new skill with appropriate support faster than they can on their own. Support can include things like help from another person, a move to a different context, or a shift to a better structured or more familiar problem. Fischer calls the level at which people perform without support their functional level, and the level at which people can perform with appropriate support their optimal level. We think of appropriate support as having two components—a realistic goal and the right amount of assistance. In other words, it hits the learning "edge" or "sweet spot", providing just the right amount of challenge and and assistance to to support a specific learner. Lectical Assessments help educators and learners to identify how much and what kind of support is required, by diagnosing test-takers' current level of skill, showing how it relates to learning targets, making suggestions about what the individual is most likely to benefit from learning next, and providing learning activities that are in their sweet spot.